When I was in high school my parents took me and my brothers to Washington, D.C., for the 4th of July. I was excited because I heard their fireworks were like no other in the country. While on our way there, we stopped at a couple of Civil War battlefields: Gettysburg and Antietam. On July 4, my parents walked us through the war memorials in D.C. During this trip, I gained a deeper connection to the information I was taught in history. We sat in the Korean War Memorial while the fireworks went off, and they were truly amazing, but the experience was more powerful. To this day, Independence Day is my favorite holiday. It is a day when people from all ages, backgrounds and beliefs come together to celebrate our country together. Here in Hendricks County, there are many options to join in celebration with our community. One day is not enough for the Brownsburg Lions Club. They have organized six days of festivities starting Wednesday, June 29. Each night there will be carnival rides in Arbuckle Acres Park along with music and food. On Monday July 4, the celebration crescendos with the annual parade at 10 a.m. and of course fireworks after dusk! Find their list of activities and schedule on their website. 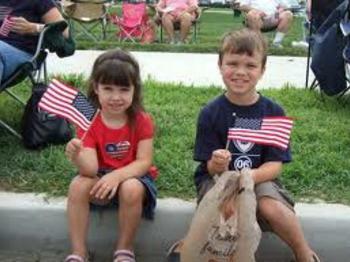 Danville welcomes everyone to their festival on the evening of July 4. Starting at 6 p.m. at Danville High School, the event includes food, family entertainment and a kids bike rodeo. Bring your lawn chairs and blankets for the fireworks show starting at 9:50 p.m. This event never disappoints! The Hendricks County Symphony fills the air with patriotic music while the family is entertained with games, bounce houses and face painting. You can bring your own food or purchase from the many options there. Although this event is heavily attended there is still plenty of space in the back of the park to spread out and even let the kids run around. Vendors open at 5 p.m., music starts at 7:30 p.m. and fireworks are at 9:55 p.m. Instead of hosting a BBQ, invite everyone to Scamahorn Park for their annual parade, fish fry, car show, live music and vendor booths. The parade is the first event at 1:30 p.m. with the rest of the fun starting afterward. Fireworks will be at 9:55 p.m.
No matter how or where you celebrate, I hope you are surrounded with great friends and family this Independence Day.